The Bishops Council of the Ukrainian Orthodox Church of the Moscow Patriarchate has elected Metropolitan Onufriy of Chernivtsi and Bukovyna as the new head of the church. "Onufriy has been elected as primate," a representative of the church's press service, Zhanna Shevchenko told journalists. 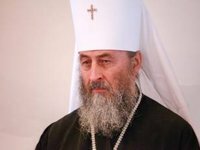 Primate of the Ukrainian Orthodox Church of the Moscow Patriarchate, Metropolitan Volodymyr (Sabodan) of Kyiv and all Ukraine died in the morning of July 5. He was the primate of the Ukrainian Orthodox Church of the Moscow Patriarchate from 1992 to 2014. Metropolitan Onufriy of Chernivtsi and Bukovyna was elected the Locum Tenens of the Metropolitan See of Kyiv on February 24, 2014. Metropolitan Onufriy (secular name Orest Berezovsky), was born in 1944 in Chernivtsi region in the family of a priest. He was ordained in 1971 taking the name of Onuphriy. In 1988 he graduated from the Moscow Theological Academy with a degree in theology. From 1988 until 1990 he served as father superior of the Dormition Pochayiv Lavra. In December 9, 1990 he was consecrated Bishop of Chernivtsi and Bukovyna. In 1994 he was elevated to the rank of archbishop, in 2000 to the rank of metropolitan.